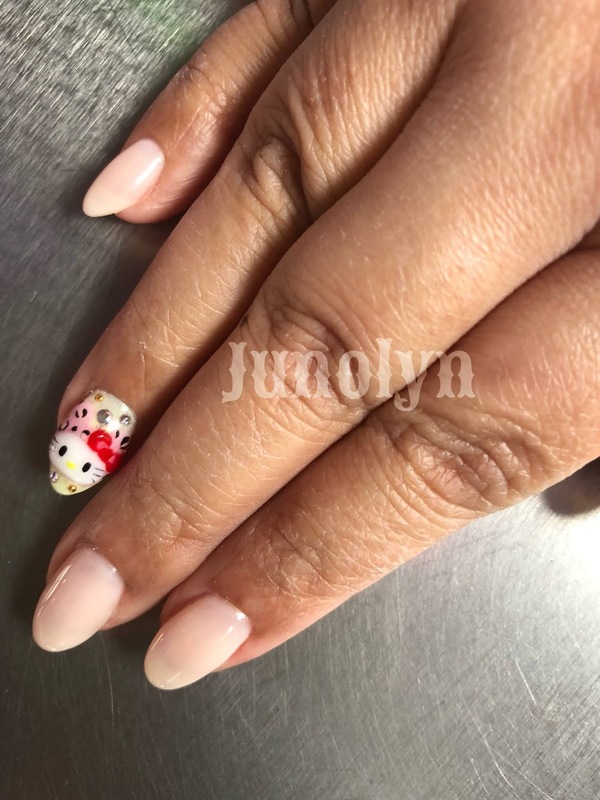 For this year, I was feeling in the mood to celebrate my birthday with a new set of Hello Kitty theme nails. 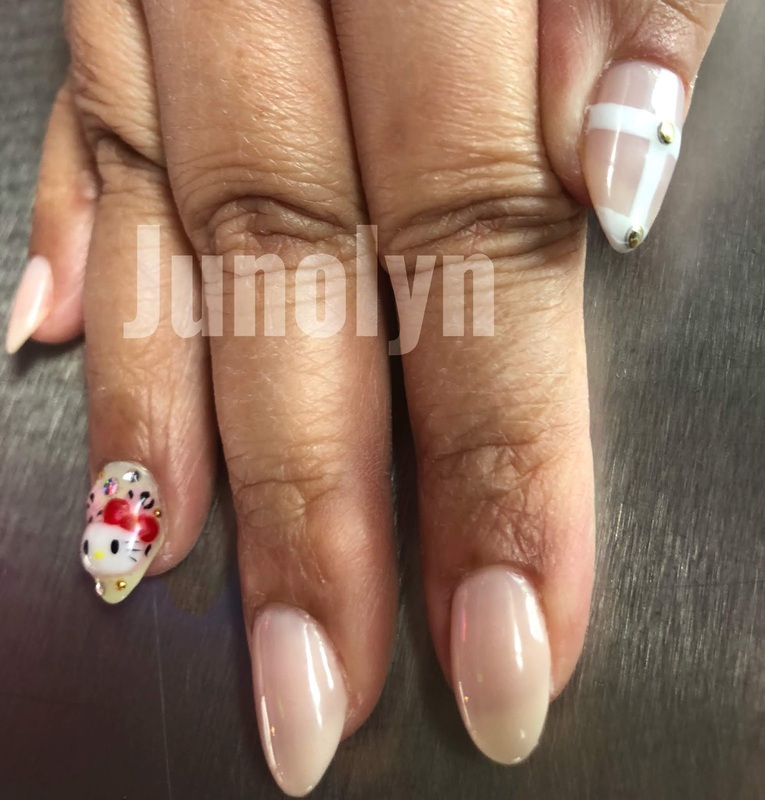 I wanted to go simple and adding a touch of elegance to the nail design. For this design, I was going for kawaii meets chic. I didn't want to go overboard by adding too much to the nail style. At the end, I just wanted to create something elegant with Hello Kitty. I wanted the colors to correlate with one another by going the pastel route. I figured that three base colors could work together to make a sweet image. Overall design--- I really did enjoy getting it done at Marie Nails in Los Angeles. My nails were done by Sayka, who did an awesome job of creating such beautiful nail art. The main color base is a very light coral pink. I remembered telling her that it was this particular color that fascinated me. The color at first glance didn't look like pink until she told me that it was based in pink. In order to get that specific pale pink, she would have to mix it to create that tone of color. 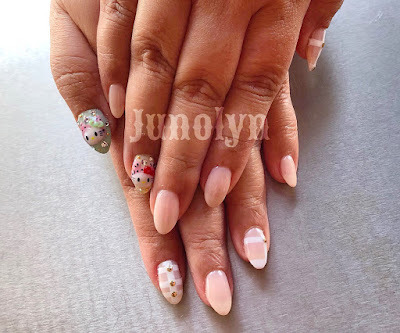 In choosing the white stripes with gold colored stones, I felt that it brought an elegance to the nail style. In order to keep it simple, I was careful not to add another white stripe style on my right hand. 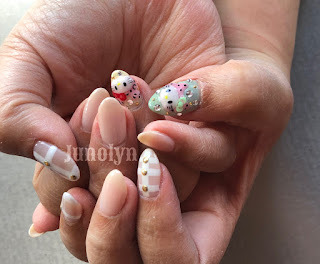 While it may be simple, I noticed that adding stones around Hello Kitty makes the style glamourous. When the light hits the stones, it makes a pretty shimmer. You would just have to see it in person to appreciate the overall design. The stones truly add a beautiful effect to the nail art. The blue green color really pops out at you. I like the effect of how pretty it turned out with the crystal and gold colored stones. The pastel pink costume on Hello Kitty adds a touch of kawaii, which goes well with the very light coral pink base. Every time I walk out of the nail salon, I am extremely happy with my nails. I enjoy making Hello Kitty part of my daily life of celebrations. Such exquisite art on my nails is another way to show my love for Hello Kitty. Whether I go very simplistic or very detailed, one thing that I know is that I will always cherish the many designs created.